About "Exponents and Scientific notation"
These are important topics in math. Here we are going to see what is exponents and what is scientific notation an also we are going to see the formulas to be used in this topic, example problems. 10² is called as 10 to the power 2 or simply called as 10 square. 10³ is called as 10 to the power 3 or simply called as 10 cube. If we have 1/2 in the power, we can simply write the base inside the radical or square root. Whenever we have to simplify two or more the terms which are multiplying with the same base,then we have to put the same base and add the powers. Whenever we have two terms, which are diving with the same base,we have to put only one base and we have to subtract the powers. In case we have negative power for any fraction or any integer and if we want to make it as positive,we can write the power as positive and we should write its reciprocal only. To convert the given number into scientific notation, first we have identify where the decimal point and non zero digit come. There are two cases in it. To move the decimal point to the left, we have to count number of digits as explained in the example given below. When we do so, we get the scientific notation of the given number. 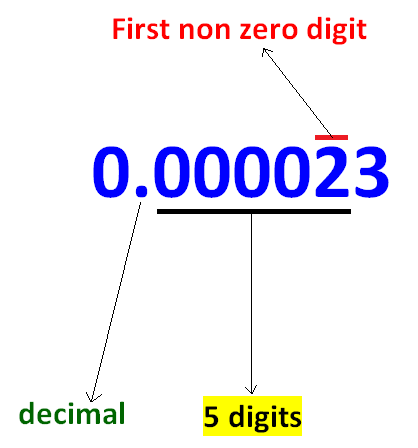 To move the decimal point to the right, we have to count number of digits as explained in the example given below. If we don't find decimal point at anywhere of the given number, we have to assume that there is decimal point at the end of the number. For example, 2300000 -------------> 2300000. After having gone through the stuff given above, we hope that the students would have understood "Exponents and scientific notation"
Apart from the stuff given above, if you want to know more about "Exponents and scientific notation", please click here.